MAKE YOUR NOTES IN THE CHIC-EST OF COLORS! 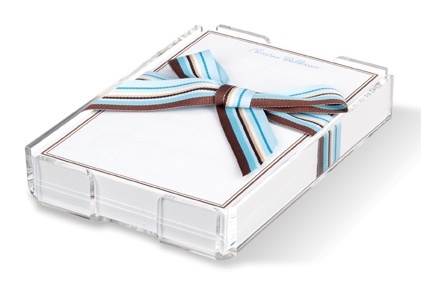 200 LOOSE SHEETS WITH A CHESTNUT COLORED BOARDER REST IN AN ACRYLIC HOLDER WRAPPED WITH A TRENDY HAND-TIED BOW. WITH YOUR PERSONALIZATION IN SKY BLUE SCRIPT, FASHION MEMOS ARE ALWAYS A SMART CHOICE. SHEETS MEASURE 4 1/8" X 6 7/16"